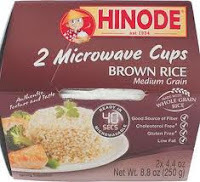 Hinode Microwaveable Rice Cups only $0.74 w/ Coupon! Bring this coupon to Walmart to get a good deal on Hinode Rice! NOTE: There are several (I saw 4) different Hinode Rice coupons. I found the $1/1 on page 4 in the Food category.